Henry “Hank” Hartsfield became an astronaut in 1969 and is a veteran of three Space Shuttle flights with 483 hours in space. 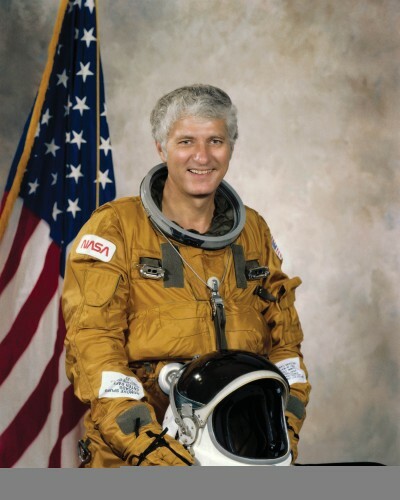 He was pilot of Space Shuttle Columbia’s fourth and final test flight, STS-4. After seven days of rigorous tests, Columbia landed on July 4, 1982, at Edwards AFB to the cheers of one million people and President and Mrs. Reagan. On STS-41D, Shuttle Discovery was four seconds from liftoff when the computer detected a problem in one of the engines and shut them down. This was the first pad abort. Commander Hartsfield and his crew members reacted quickly to make the vehicle safe. After repairs were made, Discovery roared into orbit on August 30, 1984 for its maiden voyage. The crew earned the name “Icebusters” when Hartsfield successfully removed a hazardous ice-buildup from the orbiter using the Remote Manipulator System. Hartsfield returned to orbit aboard Challenger STS-61A on October 30, 1985, commanding a crew of five Americans, two Germans and a Dutchman for a week of round the clock research in a cargo bay workshop to complete more than 75 scientific experiments in the European-built Spacelab. After his third Shuttle flight, Hartsfield held a number of administrative assignments with NASA before retiring as Vice President, Aerospace Engineering Services, at Raytheon Corp. in Houston. He was inducted into the U.S. Astronaut Hall of Fame on May 6, 2006. Hartsfield passed away at the age of 80 on July 17, 2014.